The development of highly efficient Pt-based alloy nanocatalysts is important but remains challenging for fuel cells commercialization. Here, a new class of zigzag-like platinum-zinc (Pt-Zn) alloy nanowires (NWs) with rough surface and controllable composition is reported. The merits of anisotropic one-dimensional nanostructure, stable high-index facets and coordinatively unsaturated Pt sites endow the composition-optimal Pt94Zn6 NWs with a mass activity of 7.2 and 6.2 times higher than that of commercial Pt black catalysts toward methanol/ethanol oxidation, respectively. Alloying-induced d-band electron modulation and lattice strain effects weaken the adsorption strength of poisoning species, which originally enhances the catalytic activity of Pt-Zn NWs. This study provides a new perspective of Pt-Zn electrocatalysts with intrinsic mechanism for enhanced catalytic performance. 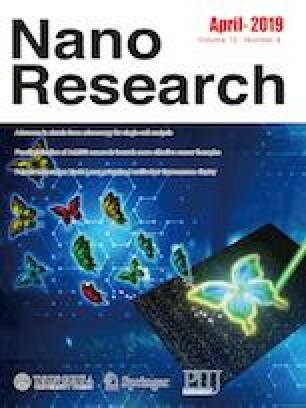 Supplementary material (additional TEM, HR-TEM, STEM images and XPS analysis of as-prepared Pt-Zn nanowires, detailed structural parameters and FT-EXAFS fitting curves of Pt L3-edge and Zn K-edge, CV curves, specific activity and CO stripping test of three different Pd-based catalysts) is available in the online version of this article at https://doi.org/10.1007/s12274-019-2374-z. This work was supported by the National Key Research and Development Program of China (No. 2016YFA0200400), the National Natural Science Foundation of China (Nos. 51571100, 51602305, 51522212, 51421002, and 51672307), Program for JLU Science and Technology Innovative Research Team (JLUSTIRT, 2017TD-09), the Fundamental Research Funds for the Central Universities and the Graduate Innovation Fund of Jilin University.